It is well known that directors owe fiduciary duties to their company. Tasked with top-level management, the Companies Act 2016 outlines statutory duties required of them to maintain the company as a going concern. These duties include the duty to act in the best interests of the company and to avoid conflicts of interest where possible. However, what do these duties actually mean in real life? In the recent case of Yeoh Seng Keong v Bircher Asia Pacific Sdn Bhd  MYCA 260, the High Court and Court of Appeal were tasked to consider those responsibilities in practice. Since Yeoh’s wife and brother-in-law knew little about the operations of the 2nd defendant, the 2nd defendant must therefore be Yeoh’s “alter ego” in carrying on the business of the plaintiff company. (1) he claimed he was merely a ‘nominee’ director for the company appointed to fulfil the ‘resident director’ statutory requirement, and he therefore was not conferred the capacity of an actual Director and could not owe directorial duties to the company. (2) He also claimed that the 2nd defendant company could not be his “alter ego” since it was owned and run independently by his wife and brother-in-law, a claim which was picked apart and unravelled under the cross examination in court. The High Court ruled against Yeoh and found that he was indeed a director who breached his duties to the company, and that the second company, for which Yeoh was neither a shareholder nor director of, was in fact his “alter ego”. His appeal was subsequently dismissed. In its judgement, the High Court found it immaterial that Yeoh had labelled himself as a ‘nominee’ director. 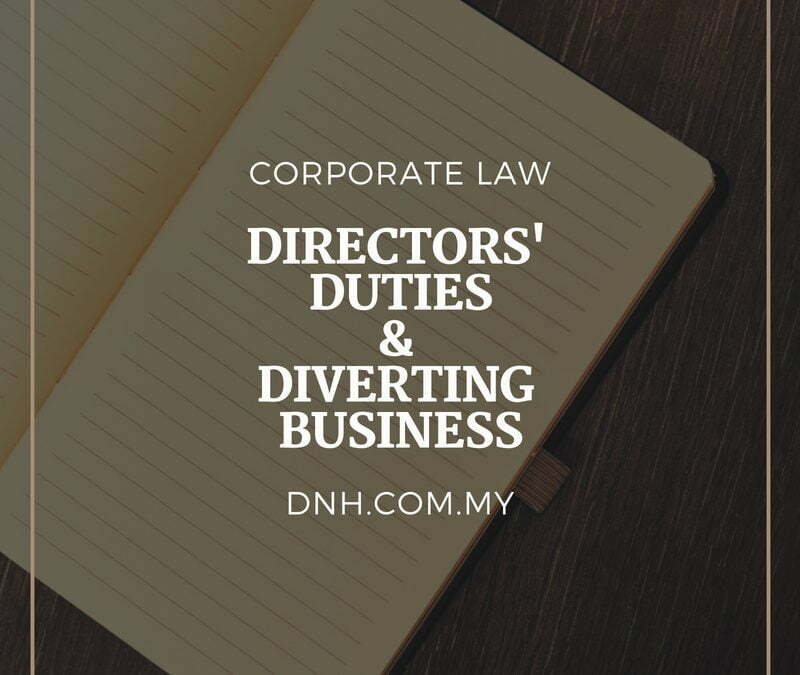 It emphasised that the Companies Act did not differentiate between the types of directors and their corresponding obligations; it simply imposed the same obligations on a ‘director’ which would include ‘nominees’ as well as those who act in a capacity accustomed to directors regardless of title. Therefore, he was considered a director squarely within the law, and therefore owed fiduciary duties to the plaintiff company. The High Court then held that by diverting the company’s business away and capitalising on its trade secrets, he was in breach of the position of trust and confidence reposed in him. It was clear from the evidence that the 2nd defendant company possessed niche expertise and products that could only be obtained through Yeoh’s knowledge and position with the plaintiff company, and that he intended to cease the company’s operations only to carry it on through the entity of the 2nd defendant. The poorly-substantiated stories concocted by Yeoh’s wife to support his defence only served to deteriorate their credibility. For instance, when questioned, Yeoh’s wife and brother-in-law admitted that they had no knowledge in the area of business the 2nd defendant company was involved in. Yeoh’s wife testified that an employee named ‘Shaun Lee’ was in charge of managing the 2nd defendant company during the entire time, handling everything from the nature of the business, its customers and its suppliers. Yet, when asked about Shaun’s existence, she was not able provide a shred of evidence. The court was then forced to conclude that Yeoh and his wife were acting in concert to withhold information, producing a fictional character and pinning the blame on him. As a result, the court ordered Yeoh to account for the loss of profits suffered by the plaintiff company as a consequence of his fiduciary breach of duties owed to such company. The High Court and Court of Appeal judgements demonstrate that there is no difference between ‘nominee’ directors and actual directors under the Companies Act 2016. So long as an individual is appointed as director, or performs functions and accepts benefits accustomed to a director, the individual accepts the duties and responsibilities that flow from it. When it comes to the content of their duties, directors must be aware of its many facets. The act of diverting businesses, utilising confidential information, and/or acting to the detriment of their company through ‘indirect entities’ will amount to breaches of their fiduciary duty. Getting caught may result in a similar order to ‘account for profits’ calculated by the estimated loss of the victimised company. It must also be cautioned that attempts to cover ones’ tracks by setting up a different company without being a shareholder or a director will unlikely hold up under the scrutiny of cross-examination in a court of law. Unsubstantiated stories by witnesses (or alter egos, in this case) can easily unravel , and the discovery of which will likely be fatal to the case. This article was written by Shawn Ho (Partner) with assistance from Quek Han Yang (Intern). Shawn leads the corporate practice group of Donovan & Ho, which has been recognised as a recommended firm for corporate, mergers & acquisitions by the Legal 500 Asia Pacific 2018. EPF and Directors' Duties: Are Sleeping Directors Liable?